Libra Mythology, legends and stories. Libra Mythology, What is it about? In Libra Mythology, Libra is a young sign. The Libra constellation lies between Virgo to the west and Scorpius to the east. Libra is the only zodiac sign that isn't symbolized by a person or an animal. 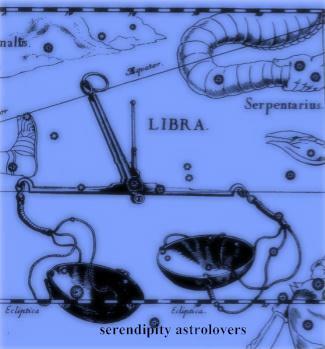 The claws of a scorpion are what symbolized Libra in the beginning, not balance. When the ancient Babylonians formulated the zodiac there was just 11 zodiac signs. In ancient Mesopotamia, an arm and the pans without a base depicted a scale. The scale was strung up with twine fastened to the center of the limb, showing a similarity to a scorpion strung up by the tail with its arms extended. There was a confusion with the translation of the words, zubana and zibanitu (meaning- weighing scale' and 'scorpion, respectively). The two translations of the words zubana and zibanitu led to the constellation the scorpion’s claws or Chelae Scorpionis. Therefore, in Babylonian Mythology, Libra started out as the claws of the Scorpio. Later when the Greeks looked at the constellation, they thought it looked like a set of scales held by Astraea or (Star-maiden). Astraea was Virgo, the Greek Goddess of Justice. So, in Greek mythology, Libra is a depiction of the scales that Virgo held. We can assume that the Greeks acknowledged that the sign stood for a set of scales because the Greek translation came from the translated Sumerian (Zib.ba.anna the Heavenly Weighing Scales), which was adapted and translated to the Akkadian (Zibanitu the Scales). Want a Libra astrology sign to be attracted to you?